The 2007-2008 Season of the American Fine Arts Festival (AFAF) once again featured a series of concerts in New York City, showcasing the talents of young musicians across the country and around the globe. Our 2007-2008 performance venues included Weill Recital Hall at Carnegie Hall, Merkin Concert Hall at Kaufman Center, the Concert Hall at German Cultural Center, and Yamaha Piano Salon. 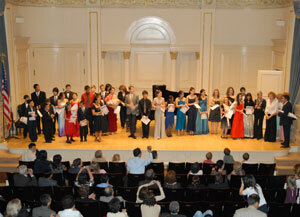 AFAF’s 2007-2008 Season also saw the return of our popular Spring Gala Concert, which was at the Weill Recital Hall at Carnegie Hall in May, 2008. Our international piano competition for young artists, the New York Grand Prix, debuted this year and was a huge success, with participants from across the United States, as well as around the globe, including Canada, India, China, and Germany.